We had a lovely day full of sunshine and expected to see few people because of the weather. When we arrived at the Royal Botanical Garden it was a flurry of activity. A rain barrel vendor was in the parking lot setting up an outdoor booth. the RBG Auxilary)were setting up in a beautiful Atrium area. Plenty of sunshine beaming in and doors to open at both ends giving us instant air conditioning the moment one was opened. Many visitors stopped at the Canadian Peony Society booth with many questions about peonies. 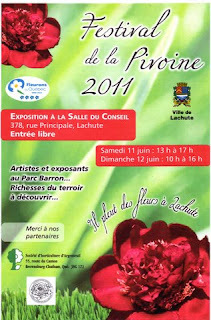 Several seeds were sold and pamphlets and brochures handed out. We had many one time visitors to RBG arriving through a bus tour from Holland. Several of these visitors did not speak English but stopped to admire the photos just the same. There were also a couple of Brides and their wedding parties that came through the Atrium on there way outside to take photo's which brought a couple of people following who stopped to take a look. The event went from 11am to 4pm. We had a great day making a few new friends and reacquainting with some old ones. We stopped to say thank you to the Head of Horticulture for inviting the CPS to the event and shook his hand. They hope to have another next year. 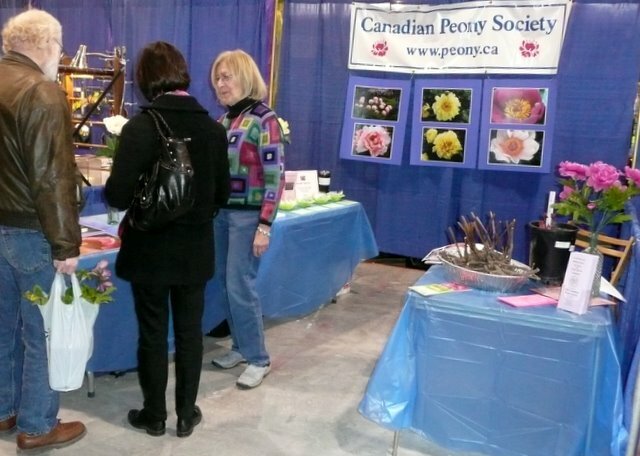 Royal Botanical Gardens "A Taste of RBG"
Join us for activities, speakers and hands-on demonstrations. 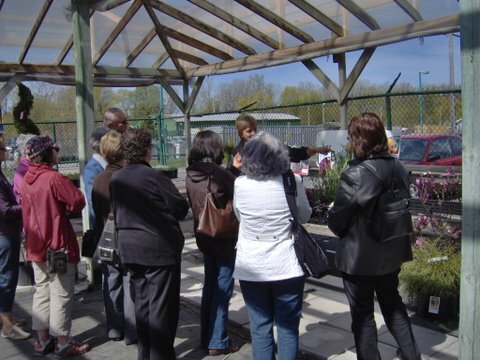 Our horticulturalists share their expertise and provide tips for your own home gardens; our ecologists help you understand what’s happening in our natural lands and the impacts of invasive species; and our researchers reveal what happens behind the scenes at RBG, and show off our 60,000-specimen-rich herbarium collection and our latest research findings. CPS will have a booth at this event. Jardins botaniques royaux "A Taste of RBG"
Sat, 30 Apr, 2011 11:00 AM - 4:00 PM Royal Botanical Gardens de Hamilton, ON Rejoignez-nous pour des activities, des conferenciers et des demonstrations pratiques. Nos horticulteurs partager leur expertise et des conseils pour vos jardins propre maison, nos ecologistes vous aider a comprendre ce qui se passe dans les coulisses de RBG, et montrer 60,000 notre - herbier echantillon riche et nos derniers resultats de recherche. CPS aura un stand lors de cet evenement. The Show was a huge success. 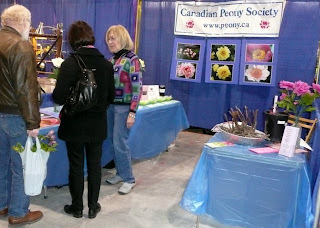 We were kept very busy Friday night and all day Saturday and Sunday answering questions about Peonies & had fun promoting the Peony Festival with the CPS Ontario Region Show at the Oshawa Valley Botanical Garden on June 11-12, 2011. 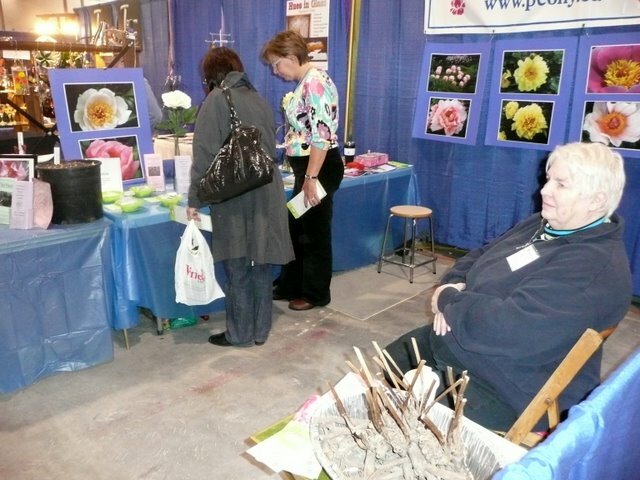 They had over 8,000 visitors last year and attendance was up this year. The selection of roots donated in 2010 were outstanding allowing for an array of choices for our members to choose from. We would like to thank all those who purchased roots making our primary source of funding the success it has been and will continue to be with your continued support. Angie Andruss, Barbara Baker, Carlos Beca, Robert Burtch, Nathalie Chaley, Chris Chirhin, Ann Finlayson, Wayne Lang, Alice Macaulay, Blaine Marchand, Eva Mitravitz, Brian Porter, Mary Pratte, Mary Ellen Simerson, Bill Wegman for their generous donations and making this years sale possible. Every year our donors manage to offer roots that were just not available the year before. Enticing many members to eagerly snap them up. As always demand was high and supplies did not keep up. We had 78 varieties of roots to choose from and a total of 153 roots available for purchase. We had 46 members request 147 roots. Gross revenue from the 2010 Root Sale was $3,322.50. Our donors spent $598.02 to ship the roots. After expenses our net profit was $2,706.75. This was down from 2009 totals but we hope with your continued support to make 2011 a prosperous year. 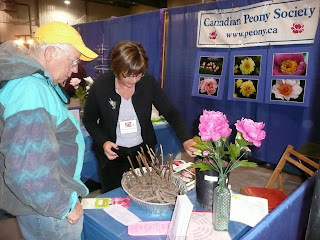 Please think of the Canadian Peony Society Root Sale when rearranging or digging up your beloved peonies and donate for 2011. We look forward to seeing the selections that will be compiled. 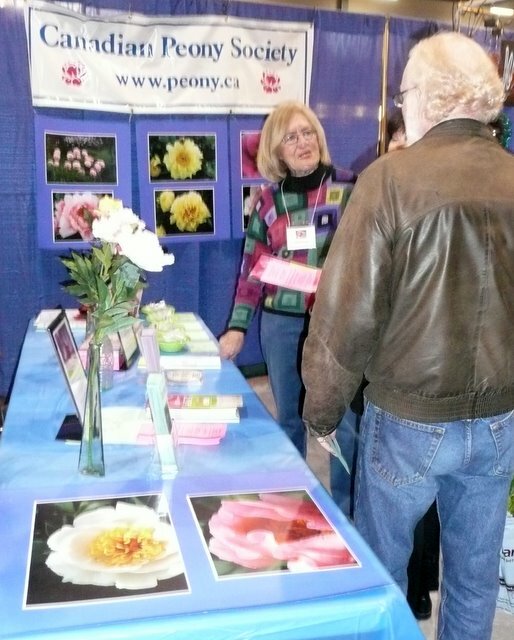 Native to China, peonies are well known and well loved perennials. Easy to grow, with glorious single or double blooms, ranging from white through yellow, pink, coral, reds and lavenders, they can remain in the garden for many decades. around Halloween and put into the garbage to avoid disease problems. Tree peonies are woody-branched with beautiful leaves. Hardy to zone 4, no pruning is needed except to remove dead or frost damaged parts. Intersectional or Itoh peonies combine the features of both tree and herbaceous peonies. Many unusual colours have been produced in the Itoh group. Plant peonies in the middle of a sunny border where their handsome leaves will form a backdrop for later flowering plants. Soil should be enriched with organic material, compost or manure and two tablespoons of bulb fertilizer, mixing well into an 8" to 9" deep hole which is then back filled, the peony roots should be covered by only 2" of soil. Failure to produce flowers is usually caused by planting too deep! 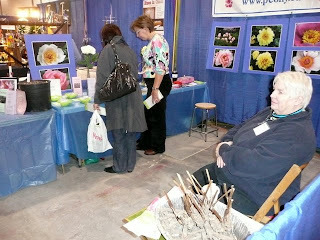 Peonies should be fertilized with a low nitrogen fertilizer when the reddish shoots emerge in spring. This is the time to place supports or peony rings, to protect the brittle new shoots and to avoid the heartache when a spring storm flattens the blooms. Repeat fertilizing after blooming. To produce larger flowers, disbudding may be done when the side buds are the size of peas, this process adds strength to young plants and reduces the weight on the stem. Deadheads should be removed to encourage plant growth. Peonies are generally disease free but can be affected by botrytis, a fungal disease which blackens the leaves. Cut off and dispose of affected leaves. Sulphur can be used in severe cases. With good soil preparation and a little patience these hardy plants will reward you with fabulous flowers for years to come.